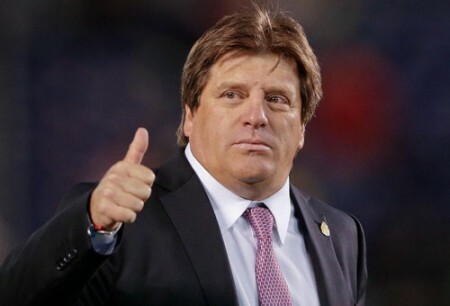 SANTOS, Brazil — Mexico coach Miguel Herrera has defended World Cup fans chanting an alleged gay slur which is under investigation by the sport’s international governing body. Mexico fans shouting the slur as the rival team’s goalkeeper takes a goal kick is “not that bad,” Herrera said Friday. “We’re with our fans. It’s something they do to pressure the opposing goalkeeper,” he said. Fare, the European fan-monitoring group, reported the chants at Mexico’s 1-0 win over Cameroon in Natal on June 13.. The FIFA (International Federation of Association Football) subsequently opened a disciplinary case against the Mexico federation, which is responsible for the behavior of its fans inside stadiums. The chant originated with fans of Mexican club Chivas, then became popular during a Mexico-United States qualifying match for the 2004 Athens Olympics played in Guadalajara. It has become a common chant at professional matches across Mexico. “That was how the chant was created and it was adopted by the other fan groups in Mexico,” Herrera said. According to Outsports.com, the slur — ¡Puto! — was chanted by Mexico’s supporters during goal kicks by the opposing team’s goal keeper. The word is slang for “fag” or “man whore” or “coward.” Some say its use in soccer is a cultural phrase that means cowardly and is not directed at gays, but the meaning is clearly designed to mock the opponent as weak and unmanly.